The Tohoku University Library had made available online part of its Kano Collection. Of the "108,000 items of classical books, scrolls, documents and art objects" from the Edo Period collected by educator–philosopher Kokichi Kano (1865-1942), 16,700 images from about 1,180 items are available online. A neat category of images to peruse are illustrated scrolls like this one. Kokichi Kano was also said to have had the world's largest collection of, ahem, "adult-oriented" ukiyoe prints, although all the ones linked to on this page are one hundred percent safe for work, minor children, and those with delicate sensibilities, such as yours truly [Yeah right, Monk. —Your loving staff]. 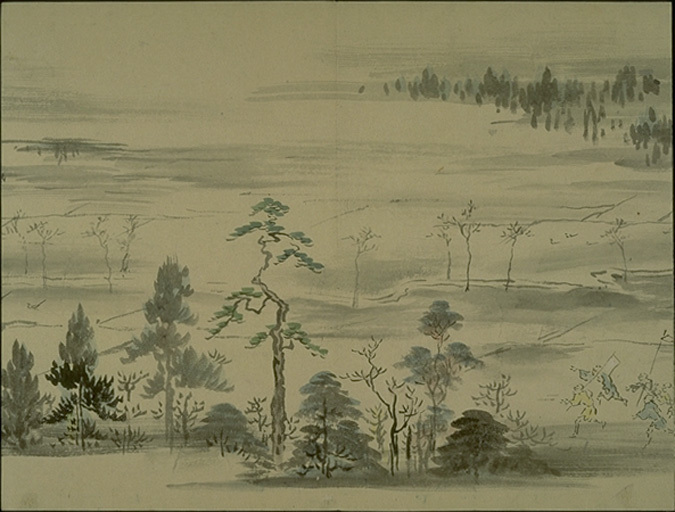 A scene from a scroll titled "The Takano Picture Scroll" (Takano Emaki).